Negotiating a three-year agreement for Local 151 at Riley Power Inc. are, l. to r.: front, Marc Posterli, Jim Owens Jr., Scott Miller, and IR Bob Heine; back, Gerry Graves, Jeff Frum, and Chuck Goodman. Negotiating a five-year agreement for Local D561 members at the Kerford Limestone Co. are, l. to r.: standing, Kit Cooper, Rex Schreiner, and Mike Hansen; sitting, Jim Rheden and Art Baldwin. Not pictured is Mike Kerr. Negotiating a six-year agreement at the Ladish Co. for members of Local 1509, Cudahy, Wis., are, l. to r.: Scott Hofer, Dan Seng, Jim Mallio, John Stewart, Duane Larson, Randy Talatzko,and Roger Reading. Negotiating a three-year agreement for L-1600 members at General American Door Co., are, l. to r.: Gumercindo Cuevas, Anselmo Allellano, and Jose Purido. Effective Nov. 1, 2006 to June 30, 2009, for members of Local 1, Chicago, who work in the plate shop at Hudson Boiler & Tank, and effective Nov. 1, 2006 through June 30, 2009, for Local 1 members working in the shop of mechanical contractor, Servcote Inc.
Local M7 — Grand Rapids, Mich. Effective Nov. 7, 2006 to Nov. 6, 2009, for 85 members of Local M7, Grand Rapids, Mich., who make Brunswick boat parts at the Attwood Corp. Effective Sept. 1, 2006 to Dec. 31, 2009, for members of Local 5, New York, who work at Fresh Meadows Mechanical, and effective June 1, 2006 to May 31, 2007, for four Local 5 members who work with small heating boilers at ROJO Mechanical LLC. Effective April 1, 2006 to March 31, 2011, for 42 members of Local D69, Waco, Texas, who produce white Portland and masonry cement at Lehigh Cement. White cement is a specialized product, manufactured to exacting standards, often used for architectural projects in which pure white concrete is specified, or as a base cement when vibrant color is desired. Because of its reflective surface, white cement is also used in highway infrastructure for traffic safety and in warm climates to reduce air conditioning costs. Local D114 — Ada, Okla. Effective Oct. 1, 2006 to Sept. 30, 2011, for 87 members of Local D114, Ada, Okla., who make cement at Holcim Inc.
Local M100 — Albany, Ga. Effective Aug. 1, 2006 to July 31, 2009, for 22 members of Local M100, Albany, Ga., who manufacture golf clubs at MacGregor Golf. Effective Oct. 10, 2006 to Oct. 9, 2009, for 55 members of Local 128, Toronto, Ontario, who work in the field for Catalyst Services in the Petro-Can industry; effective Sept. 10, 2006 to Sept. 9, 2008, for 15 Local 128 members who build and repair conveyor systems for R.J. Cyr; and effective Sept. 2, 2006 to Aug. 2, 2008, for 38 Local 128 members who clean and repair railroad tanker cars at the Procor Ltd. Oakville shop. Effective Sept. 1, 2006 to Aug. 31, 2009, for 42 members of Local 132, Galveston, Texas, who fabricate and repair heat exchangers at Dunn Heat Exchangers. Effective Oct. 1, 2006 to Sept. 30, 2009, for members of Local 146, Edmonton, Alberta, who work in the production and manufacturing of vessels at Edmonton Exchanger Manufacturing Ltd.
Local 151 — Erie, Pa. Effective September 1, 2006 to August 31, 2009, for members of Local 151, Erie, Pa., who work at Riley Power Inc., a steam generator and fuel firing equipment manufacturing facility that is part of the services business unit of Babcock Power Inc.
Local 158 — Peoria, Ill. Effective Sept. 1, 2006 to Sept. 1, 2009, for 318 members of Local 158, Peoria, Ill., who work in the production and manufacturing of mining trucks at Komatsu Mining Systems. Local 196 — Sayre, Pa. 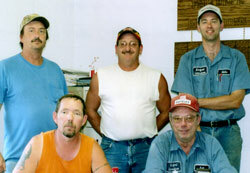 Effective Oct. 19, 2006 to Oct. 18, 2011, for members of Local 196, Sayre, Pa., who work at GE Railcar Repair Services. Local D239 — Three Forks, Mont. Effective August 1, 2006 to July 31, 2010, for 45 members of Local D239, Three Forks, Mont., who work in production and maintenance at Luzenac America, a talc producer. Local 242 — Spokane, Wash. Effective Nov. 16, 2006 to Nov. 15, 2010, for members of Local 242, Spokane, Wash., who work at EZ Loader Boat Trailers Inc., a manufacturer of aluminum and galvanized steel roller and bunk trailers. Local D263 — Clark, Nev. Effective August 1, 2006 to July 31, 2009, for 35 members of Local D263, Clark, Nev., who work for EaglePilcher Filtration and Minerals in Reno, Nev. Members make diatomaceous earth (DE) products, including filter aids and fillers for paints, catalyst supports, and polyethylene film under the trademark of Celatom®, and soil amendments and conditioners for landscaping, golf courses, and ball park infields under the trademarks of AXIS® and PLAYBALL!®. Effective October 1, 2006 to September 30, 2010, for 18 members of Local D374, Grantsville, Utah, who work in production and maintenance at the Chemical Lime Co.’s Utah plant. Effective Nov. 20, 2006 to Nov. 30, 2010, for nine members of Local D381, Las Vegas, who work in production and maintenance at the Chemical Lime Co., a producer of Calcium Hydroxide slurry (lime slurry). Slurry is often used in products and services for industrial and municipal waste treatment, sludge and soil stabilization, and waste remediation. Effective September 1, 2006 to August 31, 2010, for 18 members of Local D400, Vancouver, British Columbia, who work in production and maintenance of custom agricultural and industrial equipment at Artex Fabricators. Local 482 — Wood River, Ill. Effective Nov. 1, 2006 to Oct. 31, 2011, for 35 members of Local 482, Wood River, Ill., who repair small diesel engines at Mike’s Inc. Effective October 1, 2006 to September 30, 2010, for 27 members of Local D486, New Westminster, British Columbia, who work in production and maintenance at the Chemical Lime Co.’s Langley plant, where they produce limestone products, hydrated lime, and lime slurry. Local 500 — Salem, Ore. Effective Sept. 18, 2006 to Sept. 18, 2011, for six members of Local 500, Salem, Ore., who rebuild electric motors at the Reliance Electric Service Center. Effective August 1, 2006 to July 31, 2010, for 27 members of Local D503, Kamloops, British Columbia, who work at Graymont’s Pavilion plant, producing a range of lime and limestone products, including high calcium quicklime and screened limestone. Local D561 — Weeping Water, Neb. Effective June 25, 2006 to July 31, 2011, for 35 members of Local D561, Weeping Water, Neb., who work at Kerford Limestone Company producing over two million tons of crushed limestone each year for use in asphalt and concrete. Local D583 — Richmond, Calif. Effective Nov. 1, 2006 to Nov. 1, 2009, for 50 members of Local D583, Richmond, Calif., who produce wallboard at the National Gypsum Co.
Local 584 — Tuscaloosa, Ala. Effective Nov. 1, 2006 to Oct. 31, 2009, for seven members of Local 584, Tuscaloosa, Ala., who fabricate and service vacuum trucks for Guzzler Manufacturing Inc.
Local 903 — West Point, Miss. Effective Aug. 1, 2006 to July 31, 2009, for 465 members of Local 903, West Point, Miss., who manufacture boilers and parts for the Babcock & Wilcox Co. From a patented water tube steam boiler in 1867 to the innovations of today, Boilermakers working for the Babcock & Wilcox Co. provide parts for boiler manufacturing and environmental technology, new equipment and aftermarket products, and services to a variety of markets, including electric power, industrial, pulp and paper, renewable energy (biomass and waste-to-energy), nuclear power, environmental, and construction. Local 1240 — Wabash, Ind. Effective March 1, 2006 to August 1, 2008, for members of Local 1240, Wabash, Ind., who work at Wabash Alloys LLC. Founded in 1958, Wabash Alloys now owns eight plants and produces over five million pounds of aluminum alloy each day, for a total of 1.6 billion pounds per year. They are the world’s largest producer of recycled aluminum casting alloys. Effective Oct. 8, 2006 to Oct. 8, 2010, for 50 members of Local 1247, Chicago, who produce open die and ring rolled forgings at Charles E. Larson & Sons Inc.
Local 1509 — Cudahy, Wis. Effective October 2, 2006 to October 1, 2012, for 170 members of Local 1509, Cudahy, Wis., who produce large forgings at Ladish Co. Inc. Founded in 1905, Ladish is a family of advanced metal-working companies that supply highly engineered products and services for aerospace and industrial manufacturers around the world. Local 1600 — St. Charles, Ill. Effective May 6, 2006 to May 6, 2009, for 90 members of Local 1600, St. Charles, Ill., who make overhead garage doors for the General American Door Co., and effective November 21, 2005 to November 29, 2008, for 67 members who produce explosive powder and paint pigment at Toyal Inc. Effective Nov. 5, 2006 to Oct. 31, 2009, for members of Local 1702, Canton, Ohio, who work at the Shanafelt Manufacturing Co., where members manufacture corrugated steel material handling boxes, pallets, assembly bins, and bulk containers. They also fabricate custom foundry flasks, pins, and bushings.